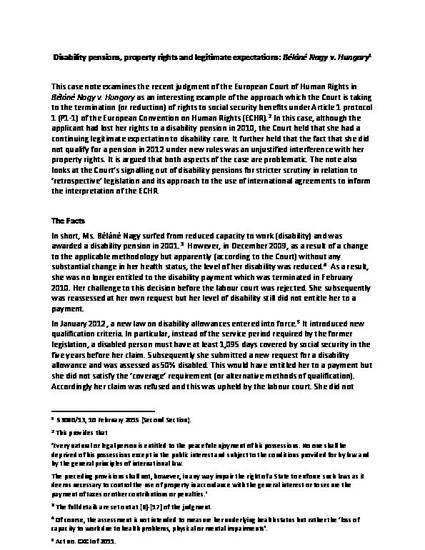 This case note examines the recent judgment of the European Court of Human Rights in Béláné Nagy v. Hungary as an interesting example of the approach which the Court is taking to the termination (or reduction) of rights to social security benefits under Article 1 Protocol 1 (P1-1) of the European Convention on Human Rights (ECHR). In this case, although the applicant had lost her rights to a disability pension in 2010, the Court held that she had a continuing legitimate expectation to disability care. It further held that the fact that she did not qualify for a pension in 2012 under new rules was an unjustified interference with her property rights. It is argued that both aspects of the case are problematic. The note also looks at the Court’s singling out of disability pensions for stricter scrutiny in relation to ‘retrospective’ legislation and its approach to the use of international agreements to inform the interpretation of the ECHR. UPDATE: The Grand Chamber (by a majority) has recently (13 December 2016) upheld the finding of a breach of P1-1 in this case.